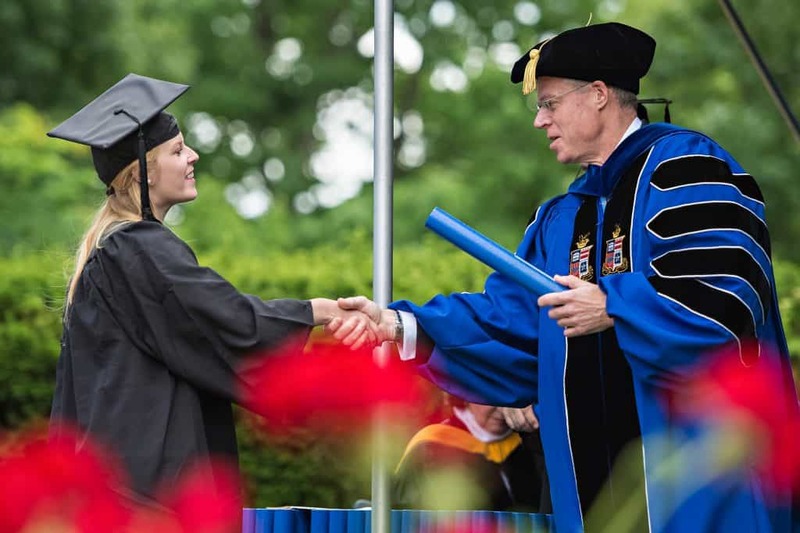 Having the university president give the commencement address is a custom at W&L that dates back to the 1930s. This was Dudley’s first such address since he became president of Washington and Lee in January. President Will Dudley distributes diplomas to the Class of 2017. Dudley told the 443 members of the Class of 2017 that the courses their lives take will contain twists, turns and surprises that they cannot currently imagine. How it unfolds will depend upon circumstances beyond their control, but also upon the decisions they make in the shifting circumstances in which they find themselves. Dudley also offered four pieces of advice: do what you love and work your tail off, don’t be afraid to change course, continue your liberal arts education and embrace your ignorance. “Learn things beyond the bounds of your professional concerns,” he said. “Expand your horizons and avoid becoming too narrowly focused. Seek out experience that transcends your current limitations. Doing so will enrich your life and it will also sustain your success in a world that is constantly changing. Wilson Miller, an economics and studio art double major from Dallas, spoke on behalf of the Class of 2017. Miller was a member of the Executive Committee of the student body for four years, serving as class representative, secretary, vice president and, most recently, president. In his remarks, Miller challenged his classmates to take two of Washington and Lee’s most venerated traditions – the Honor System and the Speaking Tradition – with them wherever they go. Wilson Miller ’17 delivers Commencement remarks on behalf of the Class of 2017. 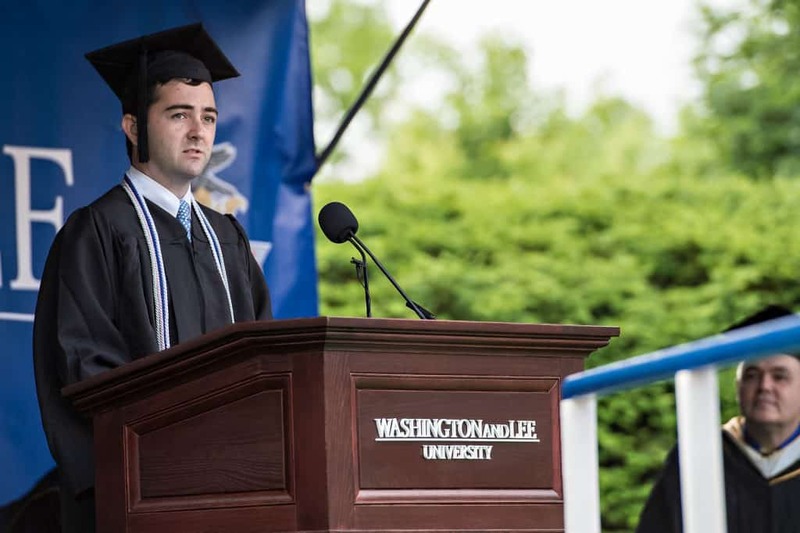 “Life at W&L exists at the unique intersection of its renowned honor system, abundant opportunity, the speaking tradition and legacy,” said Miller. “These are the great attributes of a Washington and Lee education, and our class will draw from its days in Lexington to make W&L a part of our future communities. Among Washington and Lee’s graduates were 13 who earned both a bachelor of arts and a bachelor of science degree. Altogether, the Class of 2017 earned degrees in 36 majors. 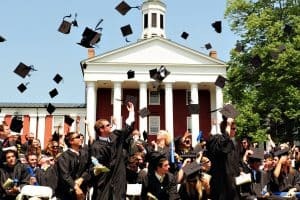 One-third of the class completed more than one major, with three students completing three majors, and 37 percent of the class completing at least one minor. For the first time in its history, W&L recognized five students as valedictorians, each with a perfect 4.0 grade-point average. The five were: Brooke Donnelly of Kennesaw, Georgia; Stephen Mitchell of Columbia, South Carolina; Zoe Ottaviani of Silver Spring, Maryland; Zach Taylor of Syracuse, New York; and Pasquale Toscano, of Kettering, Ohio.